We ate at The Silver Bough, the fantastical eight-seat Santa Barbara restaurant serving a $550 tasting menu. The most over-the-top dish at The Silver Bough, the eight-seat, $550-per-person restaurant that chef Phillip Frankland Lee opened at the Montecito Inn in Santa Barbara last Thursday, is a plate of steak and potatoes. The steak is a thick slice, about 2.75 ounces, of olive-fed A5 wagyu rib eye from Japan’s Kagawa prefecture. Lee sources this extraordinarily marbled beef, which has been billed as “the rarest steak on the planet,” from Ethan Lowry, co-founder of online meat marketplace Crowd Cow. One pound of olive-fed A5 wagyu rib eye is currently priced at $240 on Crowd Cow’s site. Even after getting a discount from Lowry, who lives in Santa Barbara, Lee says he’s serving nearly $24 of beef in his steak course. Plus, he’s making a truffle sauce for the steak. There are also mashed potatoes covered in shaved black truffle. There’s even more truffle in the dressing for the side salad with little gem lettuce and candied pecans. All in, you’re talking about a course that costs close to $50 in ingredients, Lee says during last week’s hosted media preview of The Silver Bough. He adds that a typical fine-dining restaurant might charge three times its food cost for any given dish, which means you’re looking at something like a $150 plate of steak and potatoes. 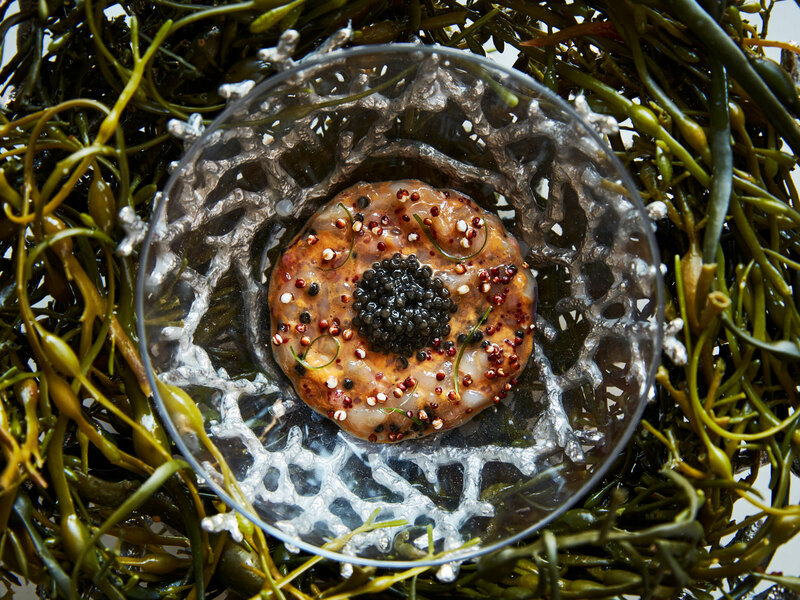 It might sound crazy to say that a $550 dinner offers a good value, but The Silver Bough is relentless in its use of luxury ingredients like truffles, Tsar Nicoulai California sturgeon caviar, and Santa Barbara spiny lobster. Dish after dish is about layering expensive items over expensive items. And the all-inclusive price includes a wine pairing, after-dinner drinks, tax, and tip. The steak is paired with a full-bodied 2015 Larkmead cabernet sauvignon, for example. If you prefer to skip wine, you can pay $450 instead of $550 and get an excellent non-alcoholic beverage pairing with juice, tea, a non-alcoholic Seedlip drink, soda, and more. Dinner, which consists of 16 courses in between canapes and mignardises, is divided into three acts. The climax of the second act is the olive-fed wagyu. There are only about 2,200 of these cattle in Kagawa, and they eat olive pulp. The result is tender, umami-rich meat that bursts with extreme beefiness. The meat and fat practically melt in your mouth. But unlike a lot of heavily marbled beef, you don’t feel overwhelmed by richness. Something about the cows consuming olive pulp, with its good, healthful fat, makes this beef unlike any other. Other highlights at The Silver Bough include the closer for the first act. It’s a beautifully creamy dish of lightly grilled king crab with a sea urchin emulsion, white wine sauce, and caviar. The third act, meanwhile, is all about Lee’s wife, pastry chef Margarita Kallas-Lee, and her wondrous desserts like Andazul blue goat cheese with local honey, fried sourdough, and black truffle. 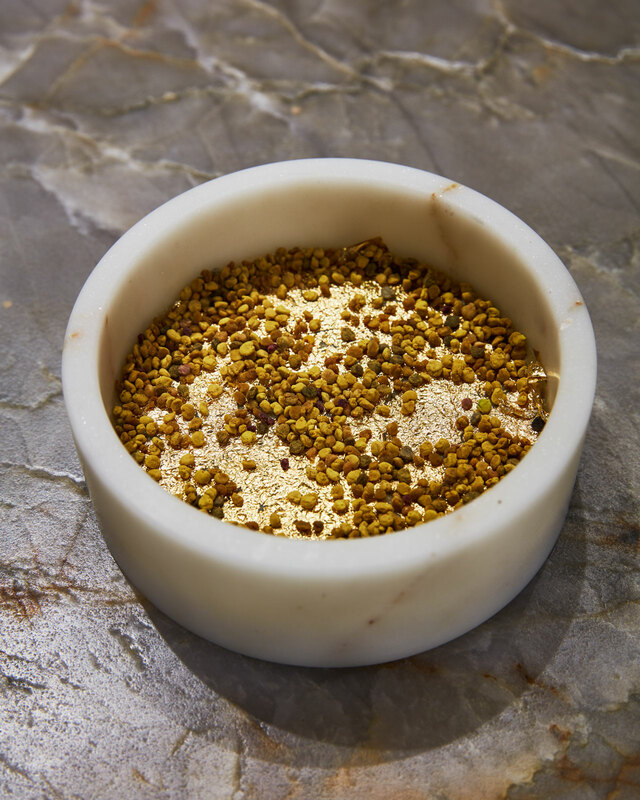 There’s also a bracingly delicious chamomile custard with black truffle, candied bee pollen, and 24-carat gold leaf. This is a restaurant that isn’t holding anything back, a fine-dining destination that walks the fine line between balancing extravagant flavors and gilding the lily. The canapés are soft bites that end with a chive-and-matcha sponge cake that has whipped butter and salmon roe inside. I am not a fan of salmon roe, so I don’t finish the sponge cake, but there is no plate to put it on, no place to hide it. So I shamefacedly drop the half-eaten canapé back on the rocks. Then a red velvet curtain opens to reveal Lee, Kallas-Lee, and sous chefs Danielle Van Steen and Robert Sandberg. There is a big metal bowl with a resplendent kinmedai, a crab leg, caviar, a live sea urchin, and a still-wriggling spiny lobster on the eight-seat counter. Act one is seafood, and two courses in I begin to worry. The first taste is caviar with 24-carat gold leaf, tiny pieces of smoked eel, and lobster gelée. The softness and intensity of the gelée after the softness and intensity of the salmon roe I didn’t finish makes me hope that The Silver Bough is done with savory jellies for the night. But then the next course is spiny lobster tartare with Santa Barbara uni and a tomato aspic. I start to panic, in this glowing, windowless room, about how I had entered a fantastical world of soft dishes designed for deities and royalty who don’t want to chew their food. As Lee told me before the restaurant opened, The Silver Bough is about “the world of the gods, the world of everlasting joy and youth and over-the-top opulence.” Lee wants this to be the restaurant industry’s version of Valhalla. Thankfully, there are some nice dishes that require more chewing later in the dinner, including a confit pigeon leg that you eat like a lollipop. An earthy bowl of lightly seared venison tenderloin includes butter-roasted chanterelles, a pigeon egg, and comforting pigeon tea that is poured over everything. Both these courses feature black truffle, too. There was one moment in this three-hour dinner where I looked at the chefs and at the other seven guests and felt like I had found the world’s final room, the secret chamber where there are no windows because nobody else should be seeing the insanity and depravity that’s happening here. If you, at that moment, had told me that aliens had taken us somewhere or that my trip home would involve a time machine, I would have been in no position to argue. But then the steak comes, and one of my dining companions marvels at the rib eye and truffle-topped potatoes. She says she hopes that Lee will open a steakhouse in the future, and I’m jolted back into reality. The dish is ridiculous in a lot of ways, but it is also something I totally understand. This is some of the best steak I had ever had, served with potatoes and a salad. Earth, though, is no place for everlasting joy. The next morning, I drive back home to L.A. during a fierce rainstorm that makes cars hydroplane down the 101. I get off the highway and stop at a Jiffy Lube because I have low tire pressure during these treacherous circumstances. After I finally get home, I eat leftover kung pao chicken with some Trader Joe’s rice as I stress out about work deadlines and other responsibilities. It feels kind of nice to have something resembling balance restored in my life. But if you knock on my door and tell me that you have a spaceship or a time machine that can transport me back to a place that’s serving olive-fed wagyu, I’ve got a tough decision to make.